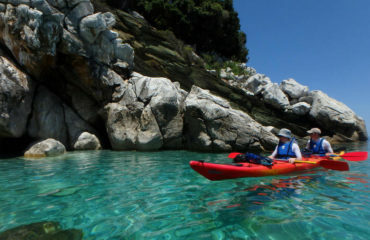 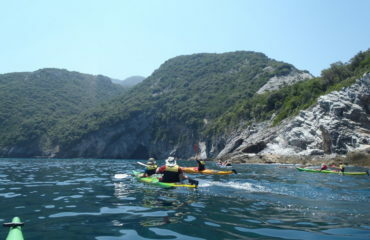 Sea Kayaking. 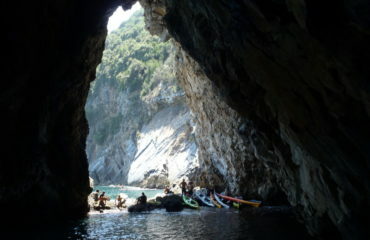 Route: “Pileas or Veneto caves”. We meet in Veneto, a picturesque small village nestling in the very north east Mt. Pelion, quite isolated and drowned in greenery at 250m. 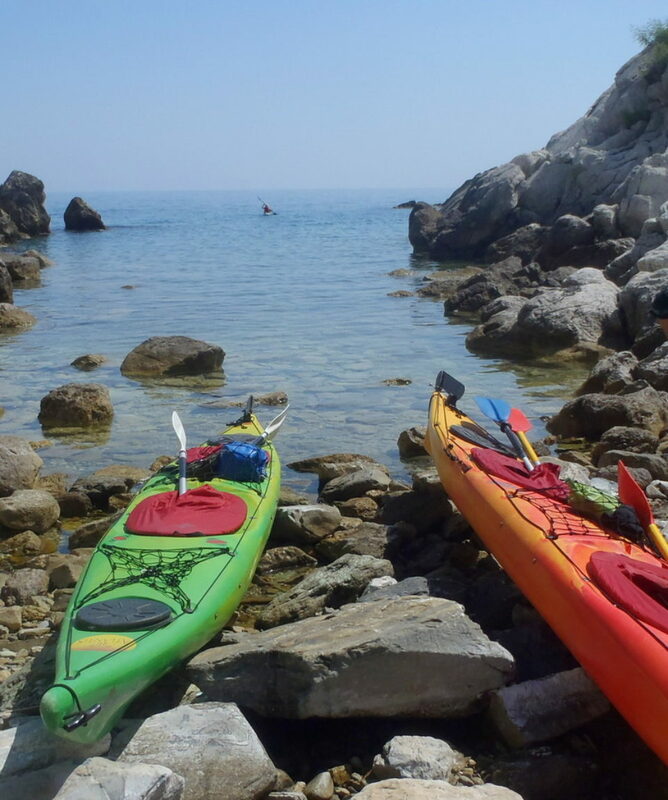 A 15′ drive down the road to the coast, brings us to the small cove Koutsoubos, the starting point for our Sea-Kayaking wandering. 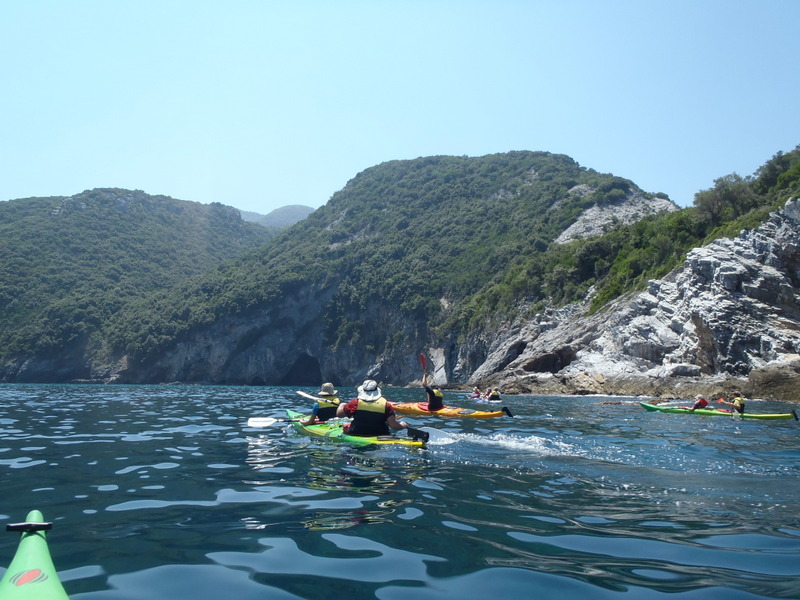 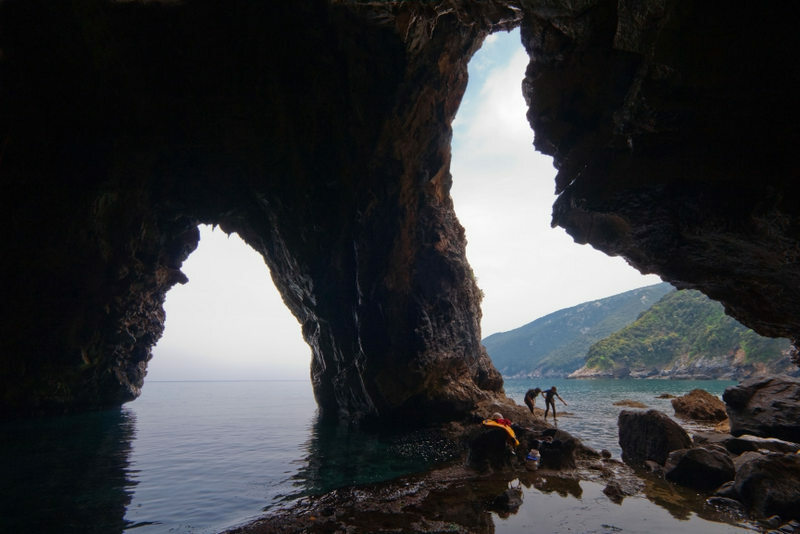 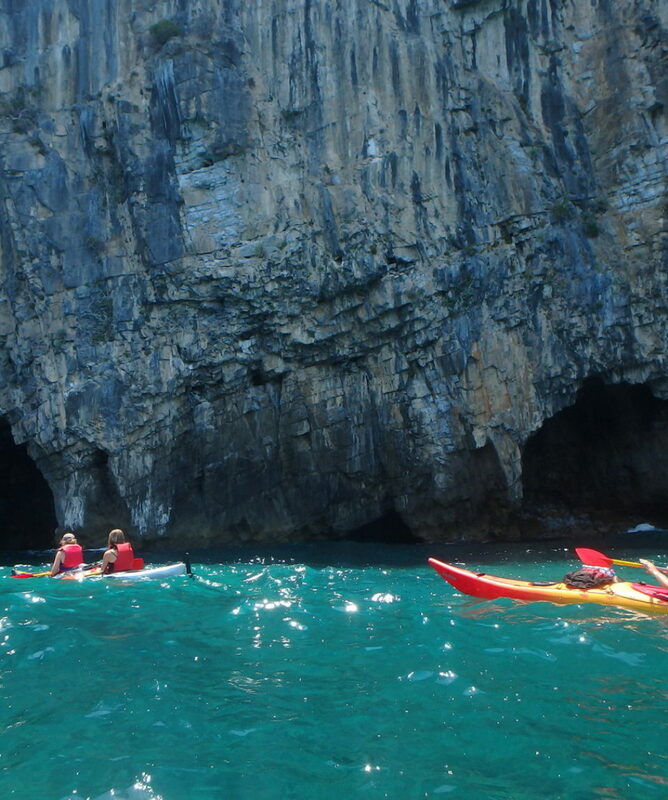 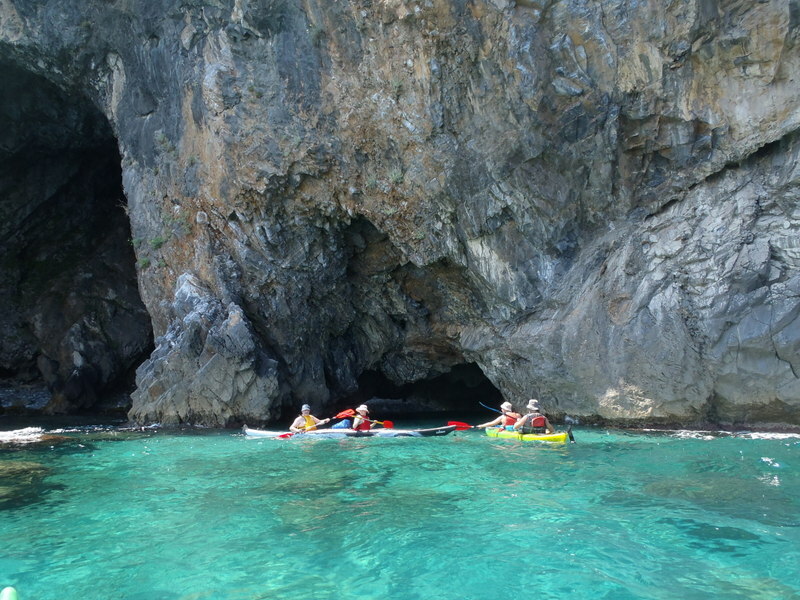 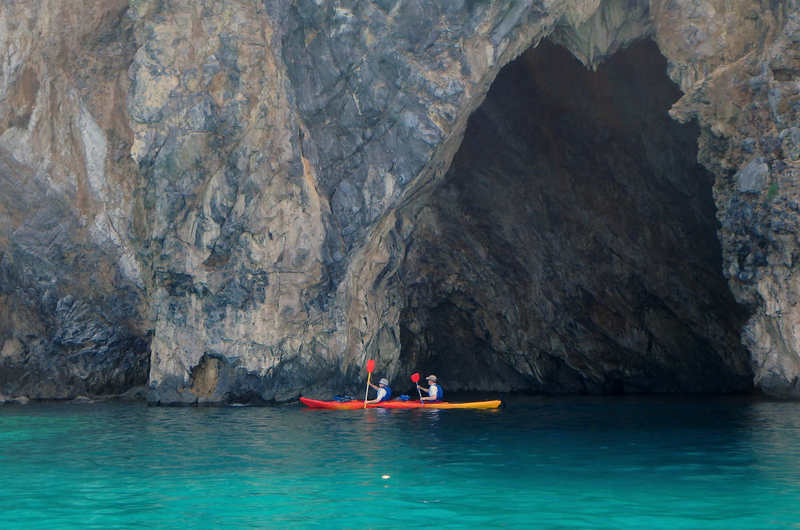 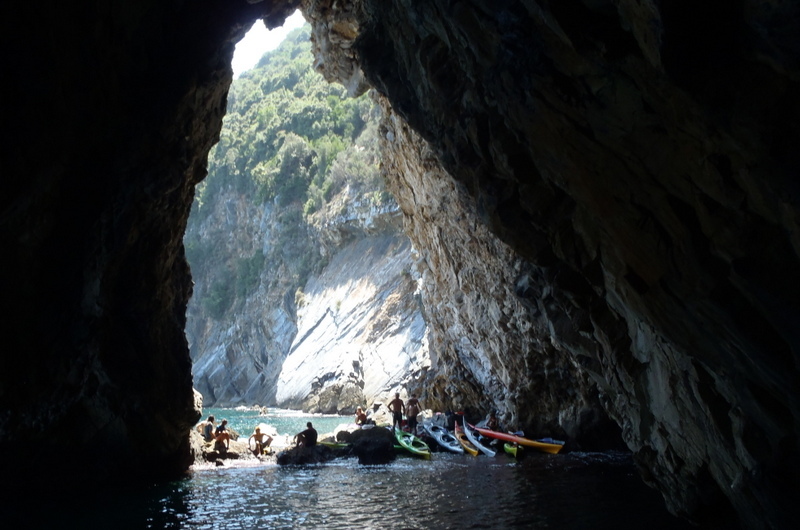 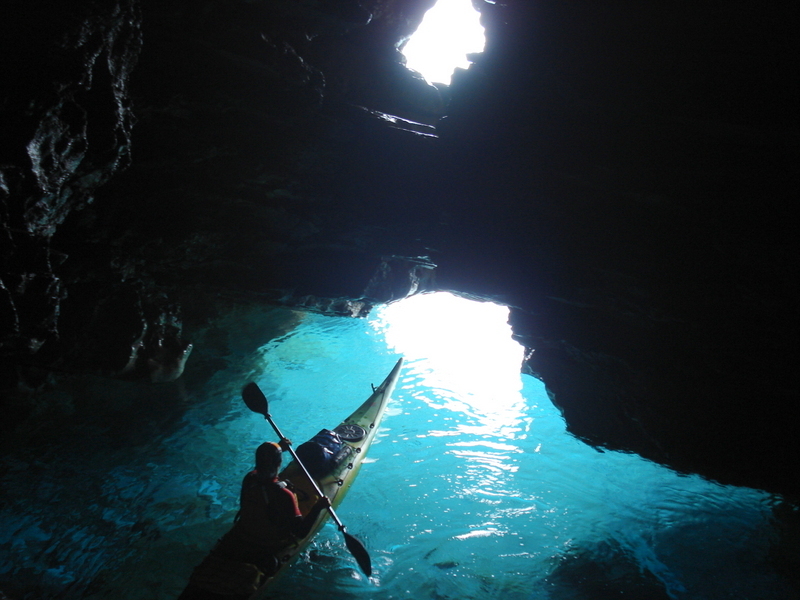 Our aim is the exploration of the impressive sea-caves of Veneto, located along a very beautiful coastline indeed, about 30 in number in a sequence of about 2 nautical miles. 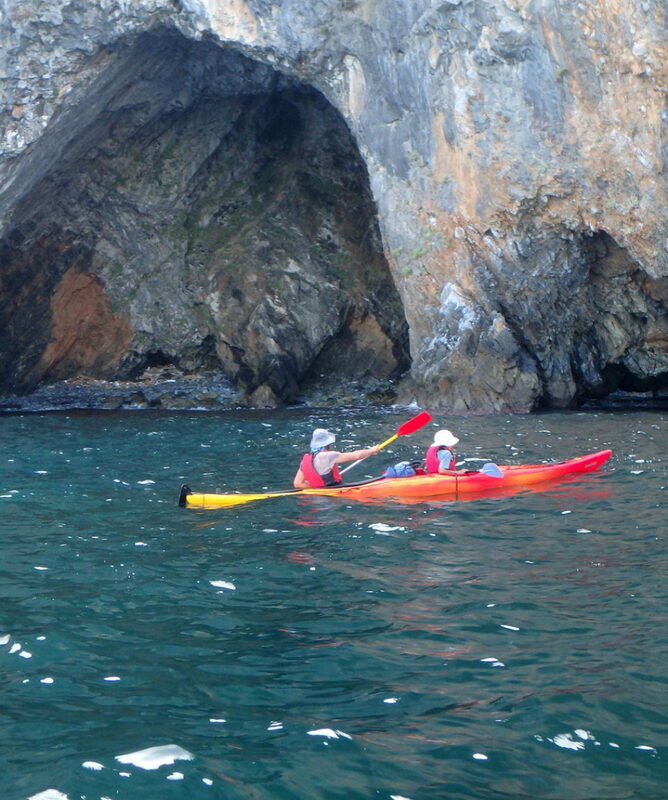 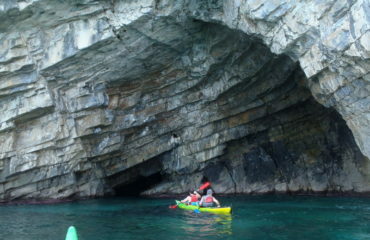 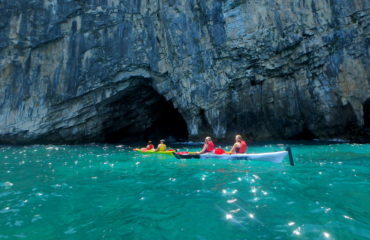 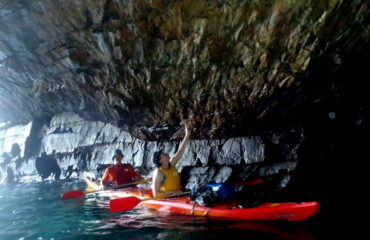 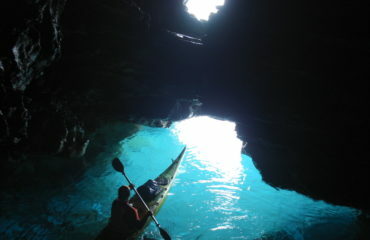 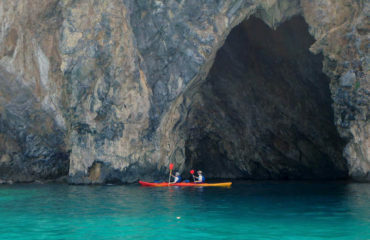 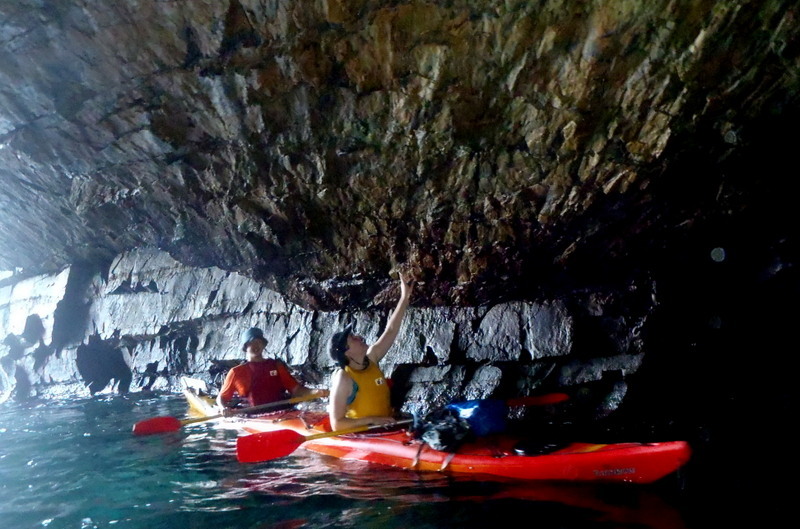 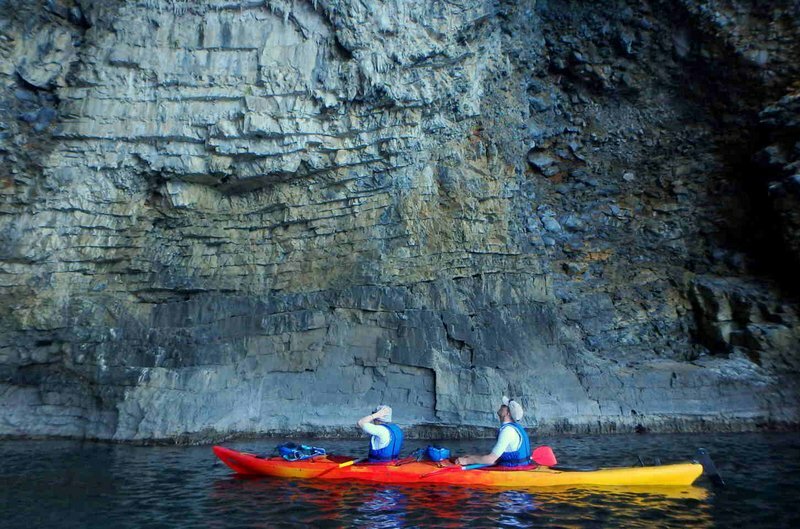 Caves of various size, rock color and formation, unroll before us along the rocky coast, inviting us to explore them. 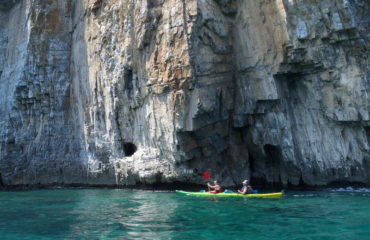 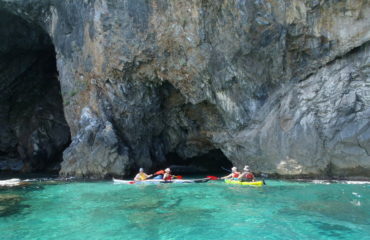 Some are big enough just for the kayak to pass through and some are as high as 35m! The entrance to most of them is only possible by the sea kayaks and the possibility of exploring them lies entirely upon this kind of vessel. 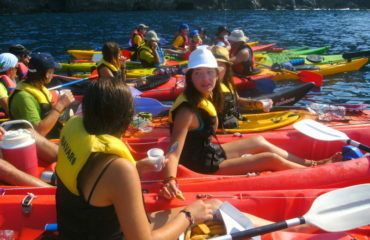 That’s why while you are there, you have the feeling of being a pioneer. 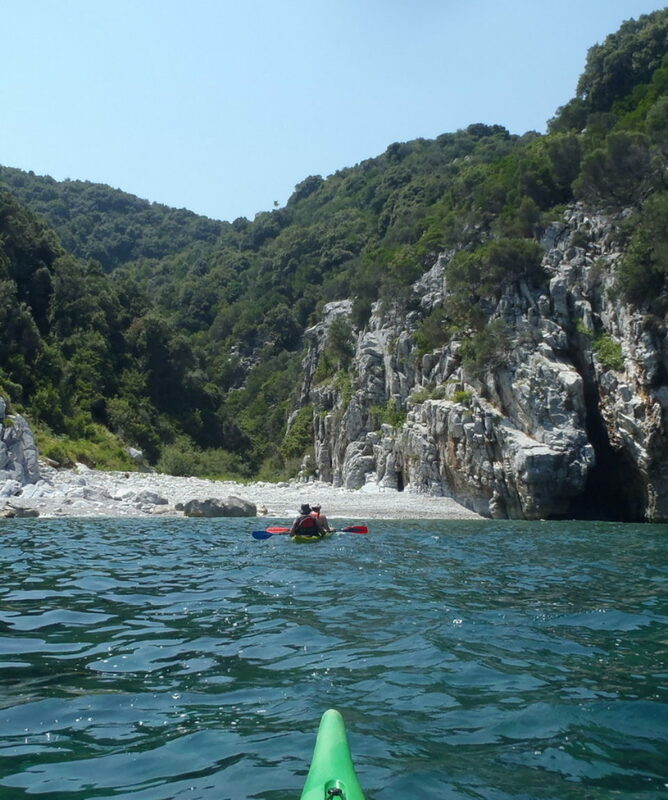 This unspoiled terrain of amazing rocky formations, isolated white pebbled tiny beaches squeezed between the rocks and the crystal clear waters, leave us literally breathless! 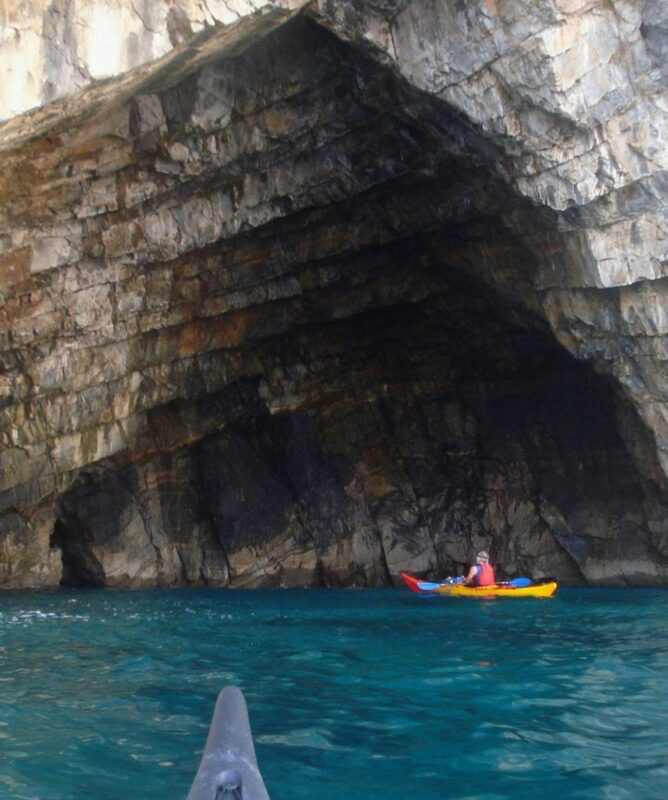 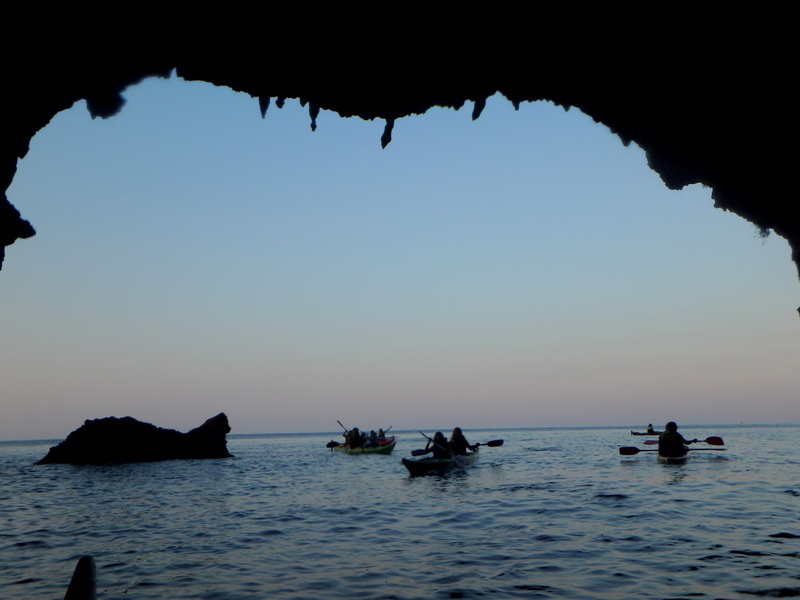 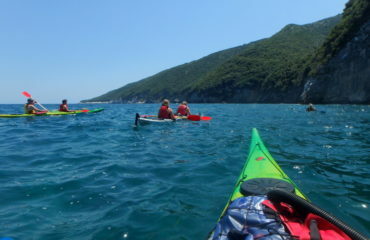 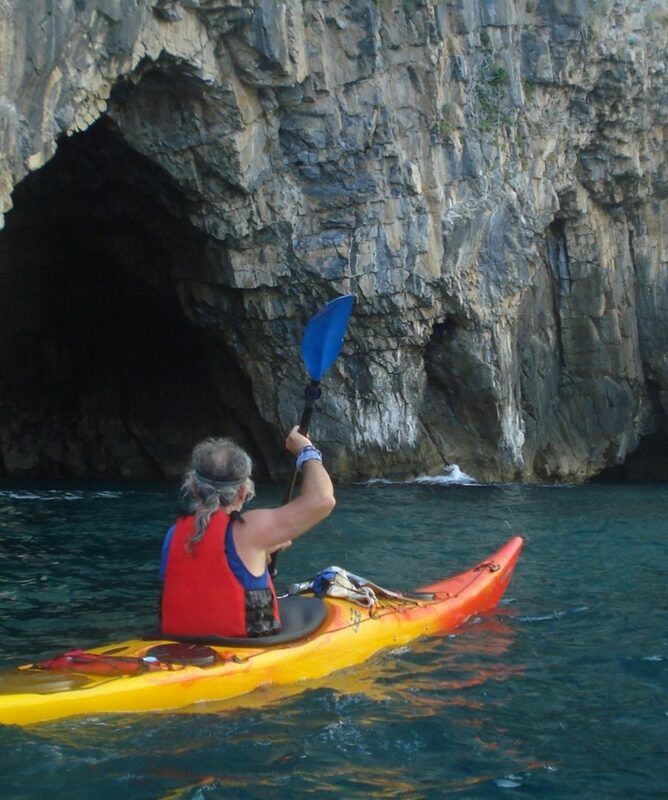 At the end of this cave world and after about 2 hours of sea cave exploration and relaxed paddling, we reach the small cove / shelter of Limnionas, where the homonymus beach. 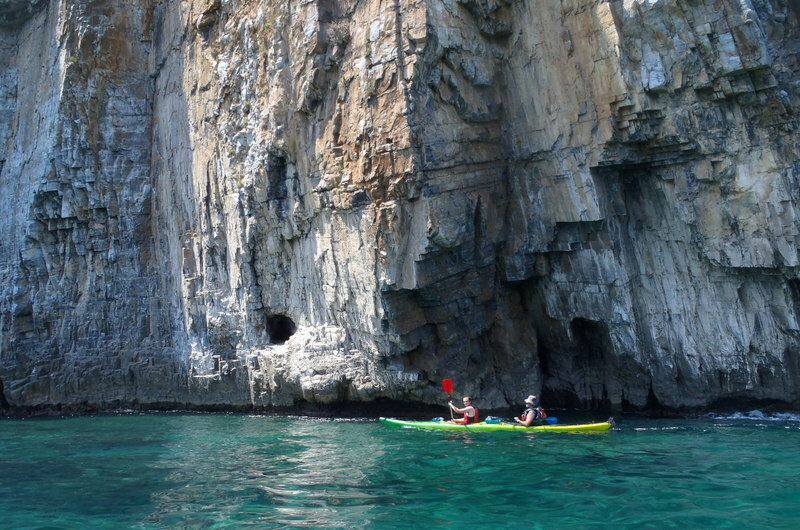 If Limnionas cove is not the nicest you have seen in your life, it is certainly going to be one of the very few nicest ones! 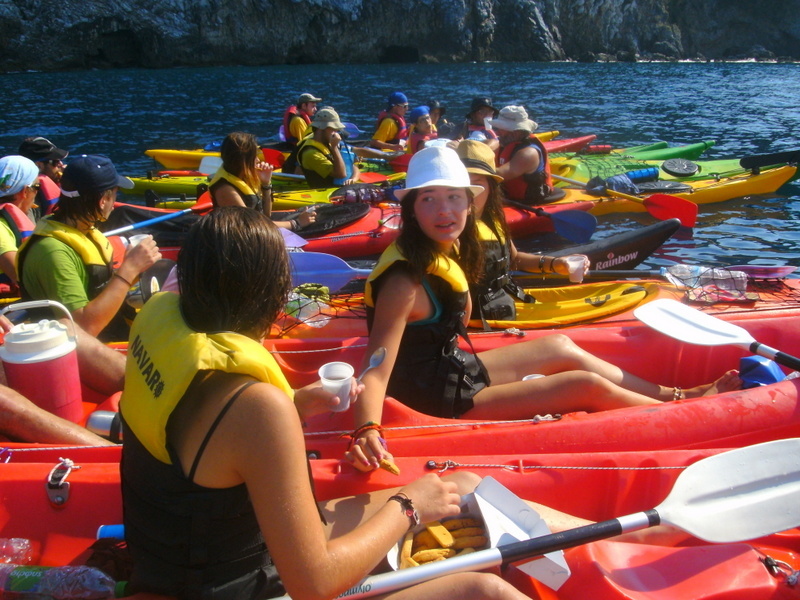 Here we enjoy hot or cold drinks and cookies, as well as swimming and snorkeling! 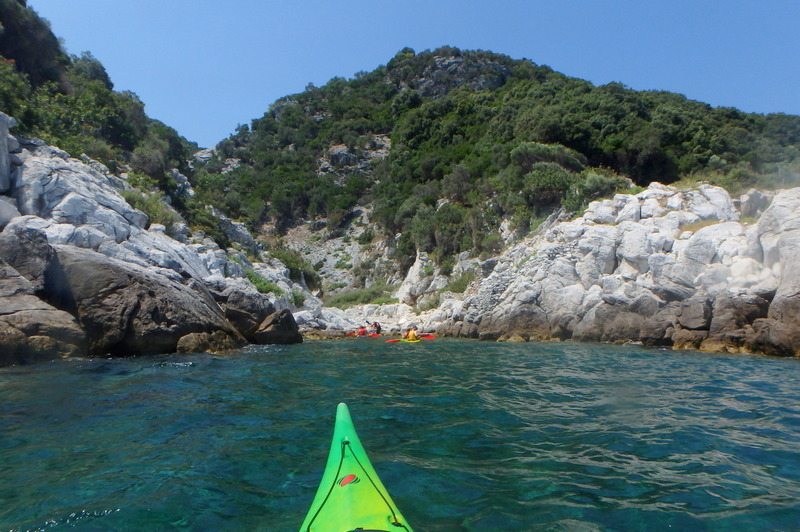 It feels hard to leave Limnionas, but it has to be done for the return. 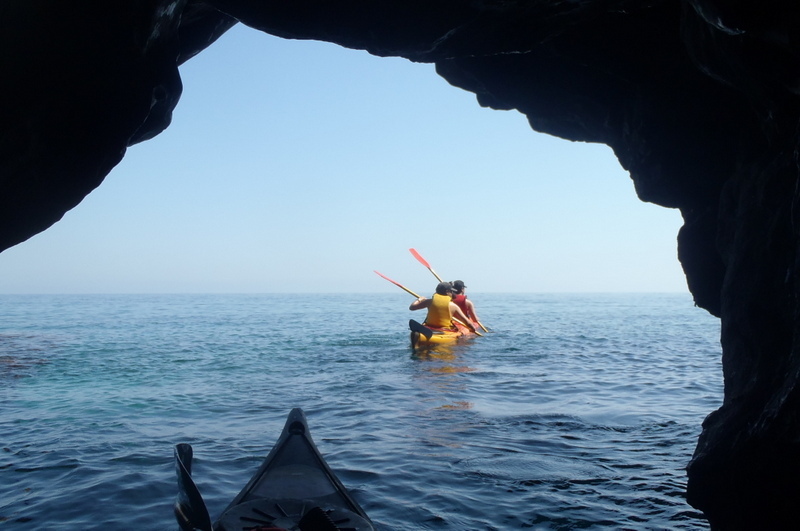 30’ to 40’ of relaxed paddling brings us back to Koutsoubos cove where the activity ends with a nice and well earned picnic. Net time in the kayaks 2.30’ to 3.00’ hours. 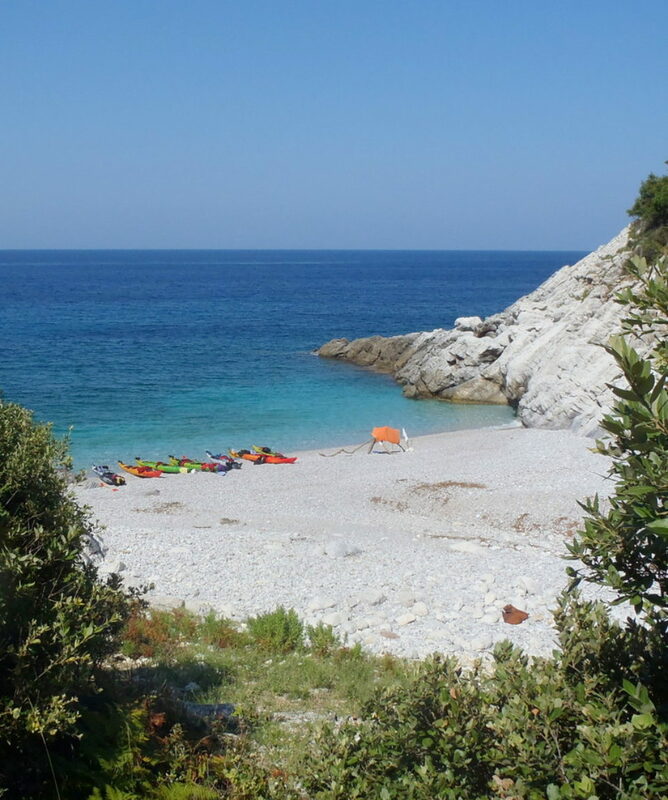 130.00€ p.p. 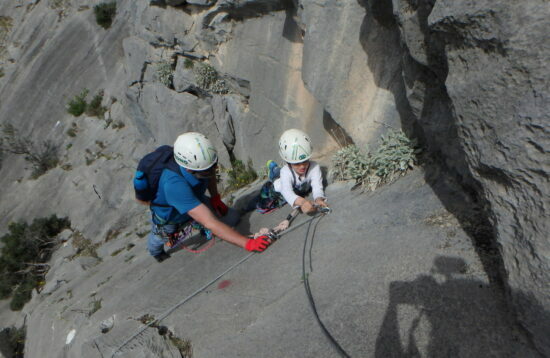 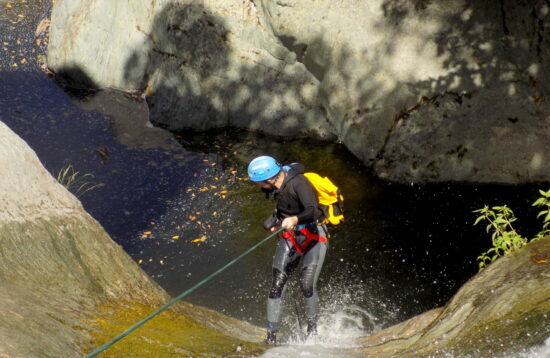 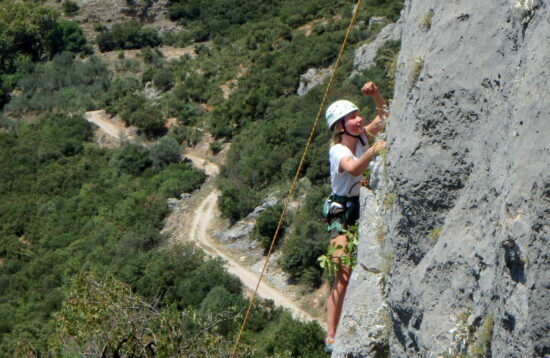 with the abseiling in the big cave as a 1-day combined activity. 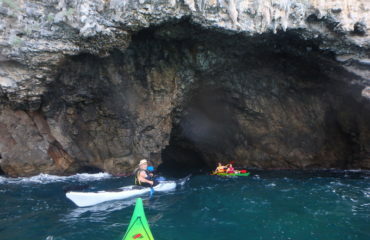 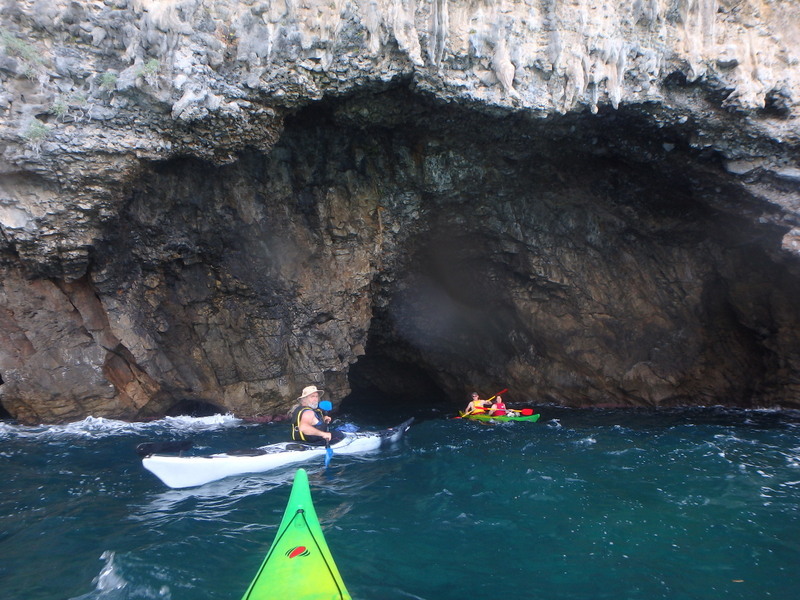 Note, that this is a full day activity, including the preparation, the stops for swimming and snorkeling and the time spent for the cave exploration. 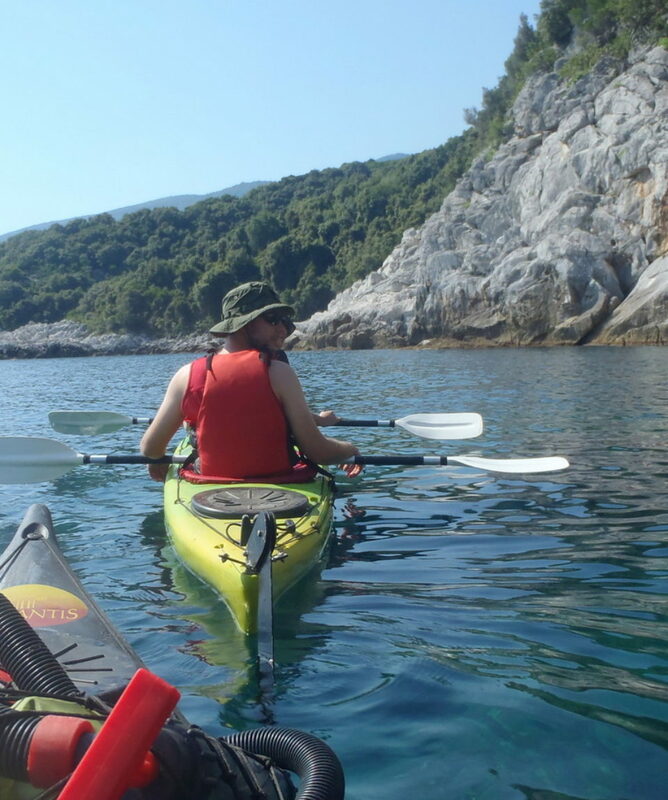 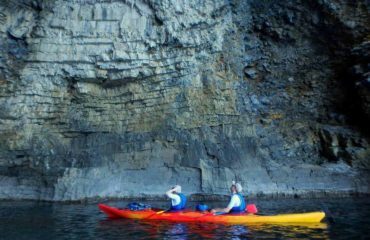 To have a clear idea of the overall duration time of the activity, you should add to the above given net time in the kayaks, another 3.00’ to 4.00’ hours. 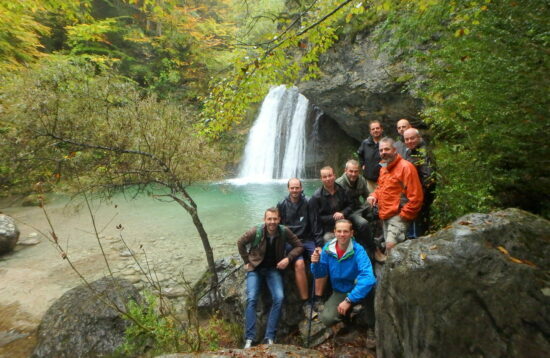 This is from the time we meet, to the “ready to return home” time.